Odisha Police Group D Jobs Recruitment-2017: Odisha Police Department released a recruitment notification for the selection available Group D Jobs in All OSAP/OSAP(SS)/IR/SIR Battalions (Odia Version). 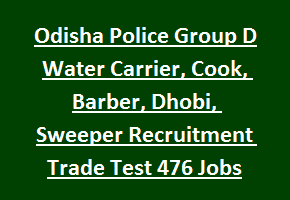 There are total 476 Group D Posts In this Odisha State Police department jobs. Available Group D Jobs are Sweeper, Cook, Dhobi, Barber and Water Carrier. Candidates who are qualified SSC/10th class and having some experience relevant trades they are eligible to apply for this Group D jobs Odisha state police dept recruitment 2017. Candidates will be selected based on written exam, physical tests and trade test. Last date to submit the application form to Odisha Police dept on or before 27-11-2017. It is mandatory attach the attested copies along with application form. More details about this Odisha Police Group D jobs are given below. As on 01-01-2017 lower age limits for this Group D posts is 18 years and upper age limit is 32 years. Age relaxations applicable to reserved candidates as per the Odisha govt norms. Candidate must have qualified SSC/10th class. Should have basic knowledge or experience of respective trade which you are going to apply. Salary will as per the Group D Posts pay scale. Candidates will be selected based on written test mark or Trade test. For more details Odisa Polcie Group d jobs refer official notification. Refer official notification for Exam Pattern and syllabus for group D jobs. Candidates who are interested in this Group D jobs they can apply on or before 27-11-2017 along with all necessary documents. Application form is available for download at www.odishapolice.gov.in. Admit Card, Exam date or Trade Test details will be displayed in the same website in due course.